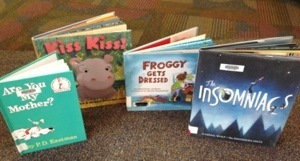 To celebrate the many moms who join me for storytime, this week we read books about mothers, mom-love, and families. I tried to steer away from the sappy books that seem to pop up for Mother’s Day and instead focused on books that work well as read-alouds for storytime and feature all kinds of moms. As families trickled in, I told everyone about the upcoming weekend event and about registration for this year’s summer reading program. Phillip Hoose, conservationist and author of several acclaimed books including Hey, Little Ant (Tricycle Press, 1998), is coming to the library during the annual shorebird festival. Hey, Little Ant is a book about tolerance that was originally written as a song by Hoose and his young daughter. The story, and song, are a conversation between a boy who is about to squish an innocent ant, and the ant. the watercolor illustrations portray the two perspectives nicely. We’re looking forward to his visit! After we were all settled, we talked about everyone’s morning, including things like what everyone had for breakfast and what animals they saw on the way to the library (often moose are included on the list this time of year). This first conversation helps all of the kids, especially the shy ones, feel more comfortable and makes participation in the storytime conversation more likely. After catching up, We got warmed up for storytime with the song Open, Shut Them. Before starting the first book, I gave them a clue about the books and why I chose them. We talked about the upcoming holiday, Mother’s Day, the letter ‘m’, mom, and other words with the letter ‘m.’ We spent a little time talking about how moms (and dads) have two names. One boy proudly proclaimed, “My mom’s name has the letter ‘m’ in it…. and an ‘o’…. and another ‘m’! We then spelled ‘mom’ all together. Everyone insisted I begin with Froggy Gets Dressed (Viking, 1992) written by Jonathan London and illustrated by Frank Remkiewicz. It’s a funny, little story about a frog who wakes up early (too early, according to the mom frog) from hibernation and wants to play in the snow. With each item of clothing he puts on, a different sound effect is included making this a great read-aloud. Unfortunately for Froggy, he is forgetful and each time he heads outside his mom calls him back to remind about an item of clothing he has missed. He dutifully starts over with the forgotten piece added to the sequence. The end gets a great laugh because Froggy forgets to put on his underwear and returns to the house for it, only to become too tired for play. Instead of going outside this time, Froggy heads back to bed much to his mom’s delight. Then it was now time for a feltboard song! Kids and adults can use fingers and hands to act out the song. Some amazing math was happening during this song! We counted up all of the ducklings and then added mama duck to get a grand total. These preschoolers are excellent counters, but kids were adding 5 + 1, then expanding to add 2 + 2 and 2 + 1. 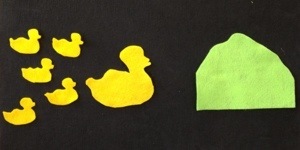 One boy probably could have played with those felt ducks using addition for much longer! Lots of proud smiles on the kiddos’ faces when I described what they were doing as math. We next read Are You my Mother? a beginning reader by P.D. Eastman (Beginner Books, 1960). This book was a little longer than most we read at storytime, but it was well-received. Kids were enthralled! I had them get comfortable before I started reading so they knew it would a story to get lost in. Its’a story about a baby bird who goes in search of his missing mother. It’s a mystery for the preschool set. Baby bird has no idea what his mother should look like, so he innocently asks everything and anything he meets “Are you my mother?” The story ends well, of course, as mother and baby are reunited. The kids loved it, asking lots of questions, commenting on the illustrations, and predicting what would happen next. We squeezed in one last story, by demand! Kiss, Kiss! by Margaret Wild and Bridget Strevens-Marzo (Simon & Schuster Books for Young Readers, 2004) was a quick book to end storytime. 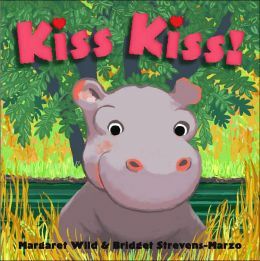 It’s a sweet book featuring a young hippo (can you say hippopotamus?) who wonders off from his mama without giving her a kiss. On his adventures, he discovers lots of other animals and each baby is giving the mom or dad a kiss. Baby hippo remembers what he forgot and rushes back past each of the animals pairs to find his own mom. After the story I told the kids in a whisper to find their mom or adult and give them a kiss before we made Mother’s Day presents. I didn’t end up reading the book Insomniacs by Karina Wolf and the Brothers Hilts (G. P. Putnam’s Sons, 2012). I often have an extra book or two so the kids can help pick what I read or if one doesn’t seem quite right for the group. This book got passed up this time around, but will be on the list for future reading. This week’s craft is a Mother’s Day gift based on one I received from my own daughter last year. She used craft leaves to decorate a jar turned lantern, but Rebecca at Sturdy for Common Things gave me the idea to use tissue paper to create vases. The kids gladly painted the miscellaneous jars I pulled from my garage with glue and then pasted on the tissue paper squares I cut before storytime. Very simple project and the vases all ended up very uniquely decorated. I only wish we could have done the project without moms so they could be surprised. Instead moms were happily working hand in hand with their little ones! 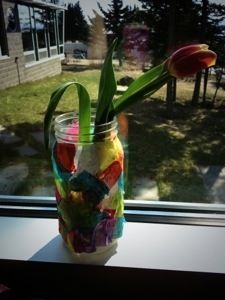 I gave each child a tulip for their new vase as they left the library. Note: Each week I print out theme-related coloring sheets for younger storytime kids or those who opt out of the craft. They are handy to have around for kids who are visiting the library later in the week and need a coloring activity while their parents are busy with other tasks.